Digitalization has moved from becoming a trend to becoming a basic necessity for organizations such as banks that need to deliver value at various levels within the information technology and digital eco-system. In such a scenario, the C-suite of banking sector needs to stay abreast of the trends and demands of digital consumers and equip themselves adequately to continue to remain relevant in this rapidly evolving market. They need to get equipped with innovative, robust, secure, flexible and optimized solutions, ready to meet the expectations of empowered and tech-savvy customers. An all-inclusive digital assurance framework that addresses all the challenges in an end-to-end digitization initiative is critical to the success of the digitization program. The framework needs to be continually aligned with the efficiency improvement and user experience improvement goals of the digitization program. The assurance framework should also be extremely agile to cater to shorter development cycles and the need to provide new features, faster. Digital evolution has also brought user experience at the center of organizations design strategy. Quality Assurance (QA) plays an equally important role in engineering consumer experience by testing for usability and accessibility. Baseline objectives: customer experience/satisfaction, efficiency, globalization, standardization and business growth. Business process optimization analysis and mapping: multi-user/system touchpoints, non-value adding/redundant processes, shared service/globalization opportunities. Derive reusable test repositories from the business process maps. Automate tests continuously on a robust, easily maintainable and scalable framework to enable testing across channels, browsers, devices, and geographies for the entire testing lifecycle. Build advanced data generation and management frameworks that help simulate all possible business cases. Extend automation and data framework to assess the achievement of performance needs. Security testing based on existing database of system vulnerabilities and potential threats. Implement a standardized usability framework deploying state-of-the art user experience testing tools and methodologies. Adopt Agile methodologies with focus on continuous delivery, progressive functional test automation (BDD/ATDD), shorter release cycles, appetite for open source (Cucumber, Ruby, JBehave, Selenium), crowd platforms for collaboration (Wiki) and DevOps. As opposed to the enterprise side of organizations (package applications, legacy platforms or custom implementations) where consolidated testing, establishing tool framework and ALM platforms, focus on productivity improvement, regression automation and cost of quality reduction are the initiatives at the forefront. It’s but natural that if the banking industry needs to be at par with the digital disruption all around, the CIOs need to increase their focus on improving and implementing digital quality assurance practices. The banking sector, therefore, needs to focus on enhancing its digital quality assurance and DevOps practices and implement them across the board – in terms of testing the technologies, over the cloud, and more. 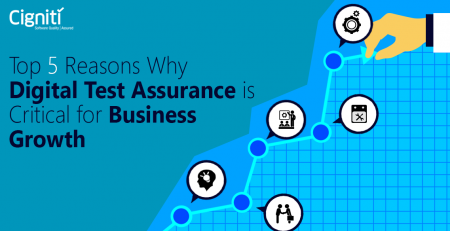 Implementing a robust digital assurance framework will help the C-class reap the benefits of digitalization. The following positive changes can be noticed happening in the organizations – a direct indicator of success. Close alignment among the quality assurance layers of the digitization initiative for better reuse and collaboration. Improved quality roll-outs with reduced costs and schedules, due to industrialized test frame-works, methodologies and repositories. An increase in the number of tech-savvy smartphone users as bank customers. Instantaneous access to data and services for end customers, facilitating an on-the-go workforce. B2B transactions and communications, as well as delivering of an omnichannel experience through emerging mobile technologies including wearables and beacons such as Google Glass and Apple Watch. An ever-growing number of payment devices and the Internet of Things (IoT). Smooth updates and upgrade. As the banking application landscape is complex and includes legacy systems, with the introduction of a robust digital assurance framework the need for constant updates and upgrades in keeping with the frequently changing market and regulatory requirements will reduce significantly. Zero glitches at ‘go live’ with superior QA initiatives. An established ‘Continuous Delivery’ mechanism that reduces the application lifecycle and increases the number of releases. This further leads to increase in capacity and quality across the organization. Implementing Agile/DevOps principles and by automating the application lifecycle helps executives ensure process improvement metrics and establish continuous feedback that reduce errors and accelerate time-to-value. Automated tools, techniques and development methodologies that help your teams to respond faster to digital technology challenges within short time frameworks, protecting and even enhancing the brand value and eliminating any reputational risks through a superior customer experience. Banks across the globe are rapidly adopting digitization techniques to help improve customer experience and operational processes, and transform their business model in order to sustain and grow their business. Digitization is happening at all levels within banks, from the operational/back-office layer to the customer touch points to facilitate holistic improvements and ensure enhanced value for customers. 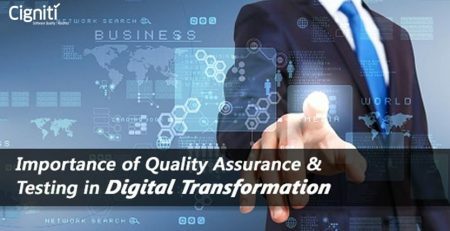 A sound quality assurance framework that will factor in all quality and security risks, enabled by robust tools, methodologies and frameworks, is imperative to the success of the digitization initiative. While Banks usually find it a challenge to confront this digital transformation, they need to understand that this is the future – and that “Up to half of the world’s banks will disappear through the cracks opened up by digital disruption of the industry” forecasts BBVA Chairman and CEO Francisco Gonzalez. Working with a reliable organization can help you overcome most of your challenges, and tread ahead on a path to a successful digital journey. 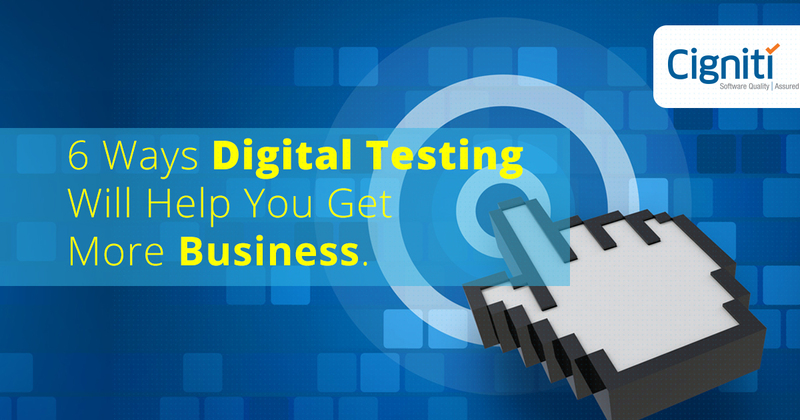 6 Ways Digital Testing Will Help You Get More Business.